When Elaine Pearce left Sydney for the seaside peace of Old Bar 12 years ago, she was assured her new house was a solid investment, with a century’s worth of frontage to guard against erosion. But three neighbours have already lost their homes to the rising ocean and there are scores more at risk as roaring seas batter the idyllic beachside town, ploughing through 40 metres of foredune in just eight years. “I wanted water frontage, and frontage I’m going to get,” Pearce joked. Property values have dived along her once exclusive cul-de-sac, with homes once worth A$1.5 or $2 million now abandoned and offered for $300,000. Weathered “For Sale” signs dot the sidewalk. Insurers will not cover homes for erosion and long-time local resident Allan Willan said the banks were even struggling to sell off the land on which the repossessed homes stand. “They can’t even give it away,” said Willan, who estimates that another five metres of frontage could “easily” be lost in the next storm period. 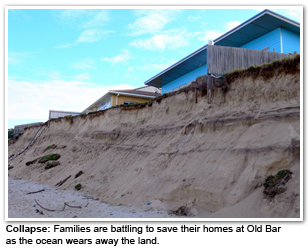 Old Bar is the most rapidly eroding and at-risk piece of coast in populous New South Wales state, losing an average one metre of seafront every year and far outstripping other areas in terms of property at risk. Andrew Short, director of Sydney University’s coastal studies unit and a government planning advisor, said the 4,000-person town was among the worst erosion sites in Australia, with huge volumes of sand routinely lost in storms. Currently there are 14 similar “hotspots” along the densely populated NSW coast – a region home to some 5.8 million Australians – with about 100 properties at risk. But Short said “many hundreds of properties, if not thousands” would be at risk in the next 50-100 years as sea levels rise due to climate change, with planning authorities factoring in a one-metre increase over the next century. Australia’s government estimates that more than $226 billion in commercial, industrial and residential property and road and rail infrastructure is at risk from erosion and inundation by 2100. That forecast includes 274,000 homes. 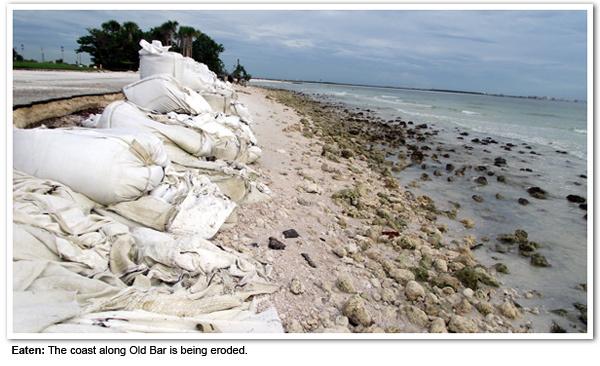 Old Bar has been in the grip of an unprecedented storm period, in terms of both frequency and strength, and University of New South Wales oceanographer Matthew England said it was a trend likely to intensify. storms to become more intense and storm surges are what really hits these low-lying coastal communities,” said England. Even with a 50 centimetre sea-level rise the government has warned that severe weather events currently considered to be once in a century, such as the major flooding of Brisbane in 2010, would happen several times a year by 2100. More than 30 people died and tens of thousands of homes were swamped in the floods that swept across northern Australia and peaked in Brisbane, forcing Australia’s third-largest city to a standstill for several days. Major cities were expected to face profound challenges from erosion and inundation, with the government warning in a 2009 report that Sydney’s airport faced closure in the next 100 years due to its low-lying waterfront location. Ports, hospitals, power stations and other critical infrastructure were also deemed to be at risk. Short said the issue was at a “tipping point” in the public’s consciousness, with new local planning guidelines showing future sea level projections and requiring people to take measures such as elevating their property. In the longer term, authorities faced a mammoth task to counter the problem, with roads, drainage systems and other infrastructure also needing lifting, he added. England said Australia “certainly stands to be hit with massive increased costs” from sea level rise, with 85 percent of its population living near the coast and insurance and liability battles already looming in the courts. “We’ve seen some properties already across the New South Wales coast being devalued by as much as 50 percent because of their vulnerability to storm surges,” he said. The residents of Old Bar are banking on a government lifeline to help them build a A$10 million artificial reef offshore to protect their dwindling beach.